Blast Pressure Sensors offer resonant frequencies to 500 kHz. Series 137B quartz ICPÂ® blast pressure pencil probes, featuring micro-second response time, offer high-level 5 V output signal capable of driving long cable runs hundreds of feet long to safe zone for data acquisition. 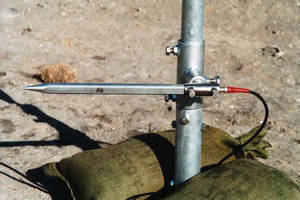 Probe sensors can capture both peak pressure and total impulse calculations. Designed for range of explosion, blast, and shock wave testing, units are suited for applications like measuring blast pressure in free-field or closed bunker arenas. Depew, NY - The Series 137B quartz, free-field, ICP® blast pressure pencil probes from PCB Piezotronics (PCB®) have been improved for durability and alignment by lowering the parts count by 40% and internal connections by 50%. The pencil probes continue to feature an extremely fast micro-second response time, with resonant frequencies to 500k Hz. The new Series 137B quartz, free-field, ICP® blast pressure pencil probes are designed for a broad range of explosion, blast, and shock wave testing. Applications include measuring blast pressure in free-field or closed bunker arenas to obtain peak pressure, total impulse, shock wave and time-of-arrival measurements often used to study blast effects on structures, vehicles, and humans. PCB® Aerospace & Defense specializes in products and programs developed exclusively for the global aerospace, civil and military aviation, defense, homeland security and test & measurement markets. Products include space-rated high temperature and high-g shock accelerometers; space-qualified hardware; sensors and instrumentation for Health and Usage Monitoring Systems (HUMS), for UAV's, helicopters, fixed wing aircraft and ground vehicles; system electronics; combustion monitoring pressure sensors; high temperature engine vibration monitoring sensors; launch and separation shock sensors; Active Noise Cancellation products; and aircraft hydraulic pressure sensors, among others. Typical applications include vibration and fatigue testing; qualification testing; aircraft and engine ground testing, flutter and flight testing; blast pressure and hydraulic system pressure measurements; structural dynamics; engine vibration monitoring; launch and separation shock studies; pressure, wind tunnel and aerodynamic studies; aircraft and ground vehicle prognostics; and noise cancellation applications. Toll-free 1-866-816-8892; email: aerosales@pcb.com.